Are you traveling to another university or research institution? 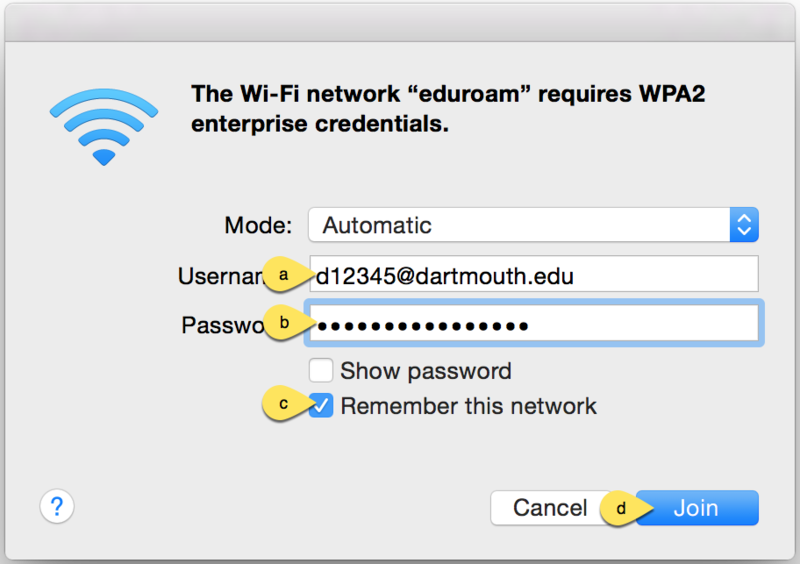 Robien Wymans, Academic Technology Consultant, shares tips to simplify connecting to the internet at Dartmouth and other global Universities by using eduroam. What is eduroam? Where can I use it? 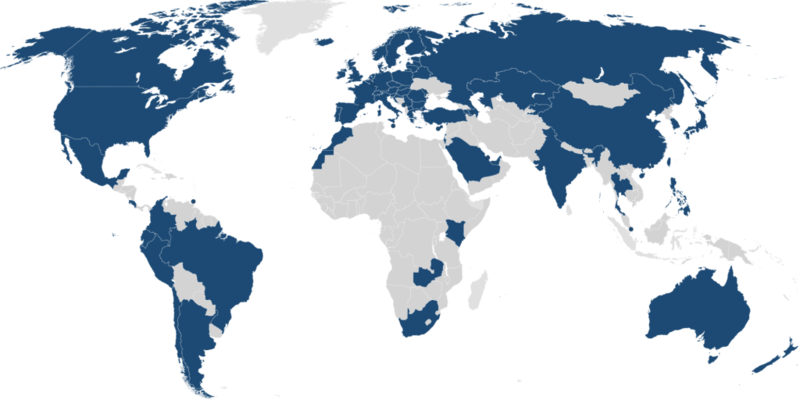 Eduroam (or, education roaming) is the secure, world-wide roaming access service developed for the international research and education community. 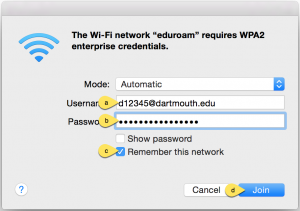 It allows students, researchers and staff from participating institutions to obtain Internet connectivity when visiting other participating institutions like Dartmouth by simply opening their laptop and connecting to the eduroam wireless network. This map shows where eduroam is generally available. Click the map to learn more about specific institutions that participate. 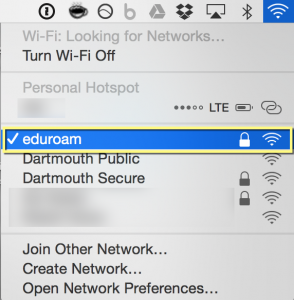 Should I use eduroam or Dartmouth Secure? Eduroam is one of the safest ways to connect when you are traveling. Eduroam allows users to connect to the secure networks and resources at other institutions. 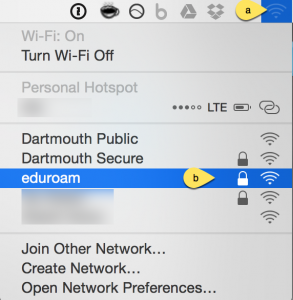 At Dartmouth, you can replace using Dartmouth Secure all together by using Eduroam instead. This will give users access to the same resources they would have on Dartmouth Secure. Eduroam will also allow most devices to connect automatically while traveling. This is how you can get connected on a Mac. If you have a PC or a mobile device, click here to learn more. 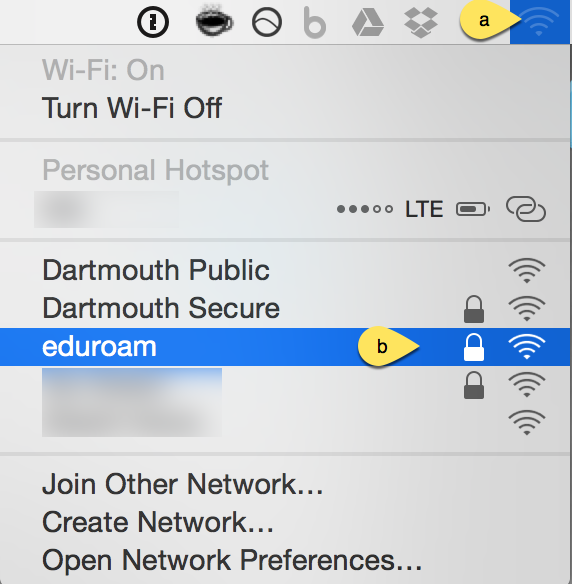 (a) Click on the wireless icon in the Mac toolbar (b) then click eduroam from the network listing. (a) enter your NetID@dartmouth.edu (e.g. d12345@dartmouth.edu) and (b) your NetID password. Then (c and d) remember this network and join. At this point, your computer should join the network. Once you are connected, you will see a check next to the eduroam network name. If you run into any issues while connecting, always contact Dartmouth Information Technology Services. Any issues that will arise once you see eduroam as a network, can be troubleshot by a tech consultant.